With such weather, it’s no surprise they spend each morning sitting on their patio, having coffee while looking out over the Caribbean Sea. From their porch they have a direct view of the turquoise waters, with palm trees and the beach stretching out in either direction. Placencia Village sits at the southern tip of a 14-mile peninsula. With rustic wood cabañas and cottages painted in every color of the rainbow, along with the “smallest main street in the world” (a pedestrian-only sidewalk filled with shops, bars, restaurants, and stores that stretches from the northern end of the village to the pier—about a mile), Placencia maintains its authentic Caribbean charm. 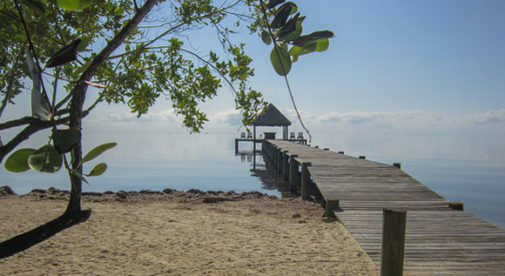 It’s also said to have the prettiest beaches in Belize, with golden sands fringed by palm trees, complete with luxury homes and resorts, brightly colored wood shacks on stilts, and a view of the lagoon and the Maya Mountains in the distance. Bill and Judy, who moved here in 2012, try to make the most of Belize’s year-round, summertime weather. “Afternoons are usually a walk to the village for lunch and to visit with friends, or chat with tourists…we love to entertain, so many nights are spent at home with friends. Everywhere we go (bank, store, restaurants) is filled with expats. It’s part of what is so fun about living in Placencia,” says Judy. Like many expats, they fell in love with Placencia because of its affordable beach lifestyle. Although it’s among the most affordable spots on the Caribbean (expat couples can live well on $1,800 to $3,000 a month, depending on their lifestyle), a great way to stretch your budget here is to embrace eating like a local. And thanks to the thriving food culture, that’s easy. “If we want to eat like the locals do, meaning chicken, fish, and local restaurant specials, I would say it’s at least 50% less [than U.S. cost]. If we want to eat like we did in the U.S., I would say it could be comparable to dining out in the U.S. We do a little bit of both,” says Judy.